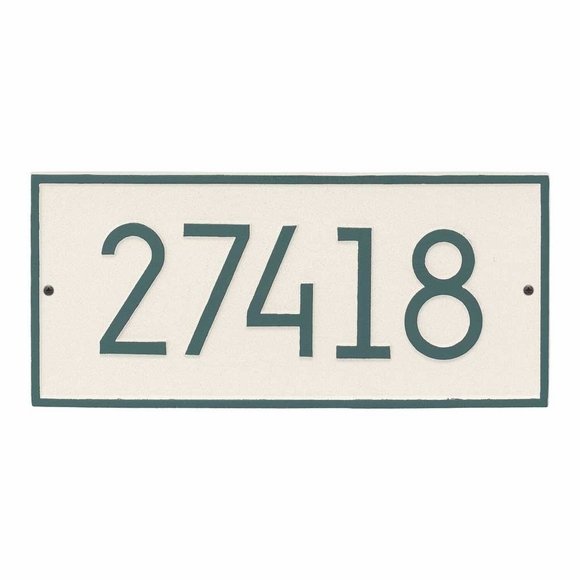 Rectangle House Number Plaque � Modern Font - - meets 911 codes. Crisp Modern Font 4" numbers are easy to read. Wall mount. Made in USA. Narrow classic border matches color of the house number. Large image shown in coastal green color. Smaller images (from left to right) are aged bronze, black/silver, coastal clay, oil rubbed bronze, pewter/silver, and white/black. Dimensions: 16.25"W x 7.5"H x .325"; weighs 3 pounds. Rectangle shape modern font address plaques with non-traditional borders are also available here. Click top link in Related Products.